Ben Shan Oolong tea, lightly oxidized, comes from Anxi County, Fujian Province. Ben Shan Oolong tea is from its own variety, one of the 12 grown in the tea-rich region. The branch are strong and heavy, the peduncle are bright and thin it look like "the node of the bamboo" but have a little tine, the color of liquor is orange. The shape of the leaf is ellipse, and the surface is ridgy. It has a similar taste as Tie Guan yin but a light, floral, orchid flavour. 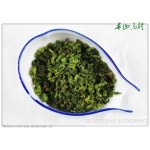 Name: Ben Shan Oolong Tea Origin : Anxi, Fujian Province, China ..